Before this past weekend, Cars was the only Pixar movie I hadn't seen. To prepare for the sequel, then, I decided to finally watch it. The first Cars was very cute and made me look forward to the sequel; unfortunately, Cars 2 isn't as good. Lightning McQueen (voiced by Owen Wilson, "Midnight in Paris") is back in Radiator Springs after winning his fourth Piston Cup. He reunites with his best friend Mater (voiced by Larry the Cable Guy, "Witless Protection") and his girlfriend Sally (voiced by Bonnie Hunt, "Hurricane Season") and is ready to enjoy his life post-race season. However, the creator of a new type of fuel, Allinal, is having a multi-country race, and he wants Lightning McQueen to compete; McQueen can't pass up the chance to beat his enemy Francesco Bernoulli (voiced by John Turturro, "The Taking of Pelham 1 2 3"), who will also be racing, so he agrees to the race and asks Mater to come with him to work in his pit crew. What they don't know, however, is that a group of lemons (as in faulty cars) want to sabotage the race so that Allinal will be ruined as a brand, and they will not stop until all the cars racing are harmed. This Cars played out more like a spy movie, and introduces Michael Caine ("Inception") as the British spy Finn McMissile, and Emily Mortimer ("Shutter Island") as Holley Shiftwell, another spy. It was fun to hear Michael Caine's voice coming from a sleek British car. Cars 2 has lots of flashy chase and action scenes, which are especially good in 3D, but the plot was not as good as its predecessor. I found myself longing to be back in Radiator Springs; the new film takes place in Japan, Italy, and finally England. Maybe see this movie. Kids will probably enjoy it, especially if they see it in 3D, but most of the kids in the audience at the screening I went to only laughed at a few sections, and they were the parts at which the adults were laughing too. The movie is still very cute, and perhaps if it had been the first Cars movie in the series, I would have liked it more, but in my opinion it was only a shade of the original. Unfortunately, there aren't many good kid-friendly movies playing in theaters right now, and Cars 2 doesn't add anything to this selection. 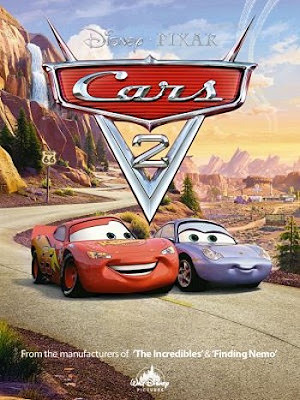 Cars 2 is out in theaters today, June 24th.